As a printing company, we love colour. We also love infographics. 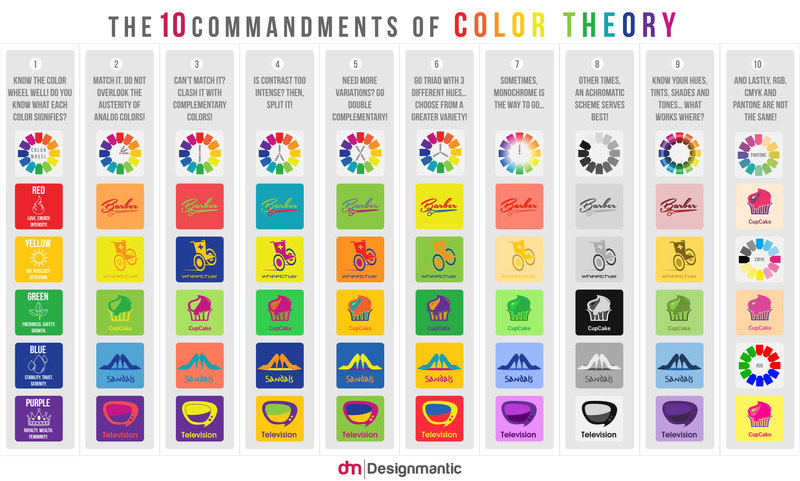 So when we found this awesome infographic about the 10 Commandments of Colour Theory, we were smitten. A glance of this infographic summarizes ten key points to think about when you’re designing and trying to determine what your colour scheme should be. Let’s face it, it’s not always easy. Follow these ten points and it will make picking out colours for your next project a breeze. Know the colour wheel well! You can learn more about how colours impact your marketing here. Match it. Try the look of analog colours, which are colours that are beside each other on the colour wheel. If you don’t want to match it, try clashing with complementary colours. These are colours opposite each other on the colour wheel. If contrast is too intense for you, split it! Try using the two colours on either side of the complementary colour. Try double the complementary colours for double the fun. This is a great way to get more variations. Go for a triad. With 3 different hues, you can have more to choose from! Sometimes you gotta stick with monochrome. And then sometimes achromatic works best. Because sometimes you want to go for the basic black and white look. Know your hues, tints, shades, and tones. A hue is the root colour on the colour wheel. A tint is when white is added to a colour (think pastels) while a shade is when black is mixed with a colour. Any colour that is “greyed down” is considered a tone – that’s when both white and black is added to a colour. RGB, CMYK, and Pantone are not the same! RGB is the colour model that is used for web design, consisting of red, green, and blue. CMYK is the colour mode that is used for print design and consists of cyan, magenta, yellow, and black. Pantone is a solid colour matching system that is typically used for offset printing. Is there anything else that you would add to this infographic? Every designer should know the color wheel! Great information indeed. Really essential for the graphic designers.